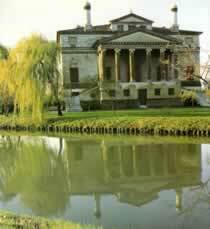 Villas and Wine on the Veneto Mainland. In the 1500 the Venetian Republic was ready to exploit to the full the agricultural potential of its mainland territories. The government offered substantial subsidies for reclamation of marshlands and the aristocracy began to build beautiful villas on their country estates. Between the 15th and the 18th Cs more than 2000 country residences were built throughout the Veneto by the richest Venetian families. This phenomenon became known as the Civilization of the Villas. Palladio became the ideal architect who knew how to build cheaply and quickly and was also thoroughly versed in the newly fashionable architectural vocabulary of ancient and contemporary Roman buildings. Palladian Villas were intended to express the ideals of reason, humanity and civilisation in Renaissance life, and to provide practical settings from which the sophisticated merchants from Venice could exercise their privileges as landowners and their responsibilities as farmers – provisioning the cities where they too spent much of their lives. Our tour will take you to visit some of the most outstanding country houses following the celebrated wine routes of the Veneto Region, stopping here and there for food and wine tasting , thus pleasing both your minds and your palates. We’ll have lunch in a typical Veneto restaurant. Admission fees vary depending on the itinerary chosen.